This Mineral Fusion Liquid Lip Gloss in Polished is formulated to make lips soft and supple as it adds clear, ultra-glossy shine. 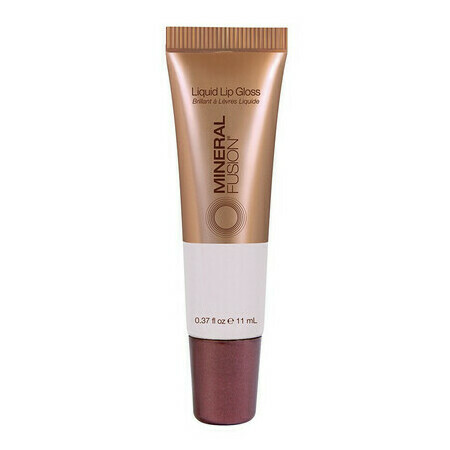 With ingredients such as Sunflower Seed oil and Vitamin E providing nourishing hydration, and antioxidant-rich Pomegranate Seed oil, Grape Seed oil and Vitamin C offering anti-ageing protection from free radicals, this non-sticky lip gloss glides on easily to give a smooth, long-lasting finish. Mineral Fusion is partnered with the National Coalition Against Domestic Violence, which directly supports survivors of domestic violence and operates a national campaign to raise awareness of the problem. Made in the USA. EWG VERIFIED™, which includes compliance with strict ingredient standards, good manufacturing practices and robust labeling, Vegan, Gluten free, Certified Cruelty free. Please note: Unfortunately due to Customs and Postal regulations, we are unable to send this product overseas outside of Australia. Pomegranate, Rooibos Tea, Sunflower Oil, Vitamin C, Vitamin E, White Tea. Octyldodecanol, Ethylcellulose, Natural Flavor, Helianthus Annuus (Sunflower) Seed Oil, Punica Granatum (Pomegranate) Seed Oil, Tocopheryl Acetate (Vitamin E), Vitis Vinifera (Grape) Seed Oil, Aspalathus Linearis (Rooibus Red Tea) Leaf Extract, Camellia Sinensis (White Tea) Leaf Extract, Ascorbyl Palmitate (Vitamin C), Macrocystis Pyrifera (Sea Kelp) Extract. Can be worn alone or layered over lip pencil or lipstick. love, love, love! I'm not really a lip gloss person, but I carry this when I know I won't be able to easily reapply lippie and it just makes my lips look beautiful! A lovely consistency, moisturising and smells great.